I have been waiting impatiently for the Postie to deliver Christmas fabric for a couple of weeks; I expect it has been waylaid by HM Customs. I was feeling peeved as the week passed when the only item larger than a bill that came through the letterbox was my copy of the not-so-scintillating “Times Educational Supplement”. However, a large package arrived on Thursday from Australia that I made myself save until I had done all of my chores and made a large jug of coffee. 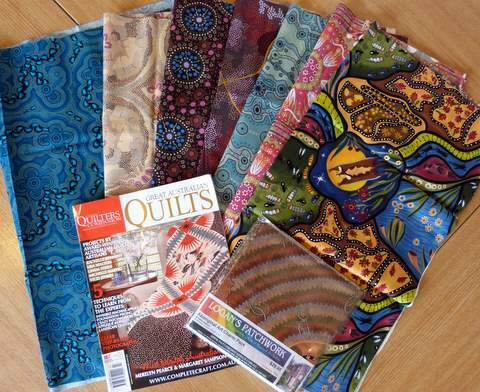 It was such a treat to read a magazine from Down Under and drool over some new Aboriginal fabrics specially chosen by Christine – THANK YOU!! 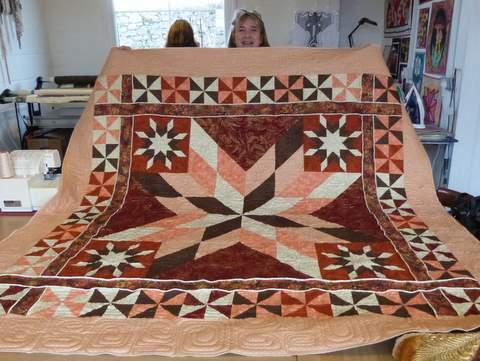 After I have got the two Yurt exhibitions out of the way I plan to complete Bewitched 2 and start a second large Australian quilt. Maybe I should even consider entering an Aussie show or two if I find time to make something worthwhile. Another package that arrived contained the micro digital projector. I have just about managed to figure out how it works since all equipment these days comes without useful instructions. I have made a start on the quilted projector screen that I intend to hang inside the Yurt – it is white on one side and gold lame on the other so that it can sometimes be used to project images and when reversed it can simply be decorative. I think it might be fun to project movies onto it outside. Maybe if we wear LOTS of clothes and light a bonfire we could pretend to be at a drive-in movie. 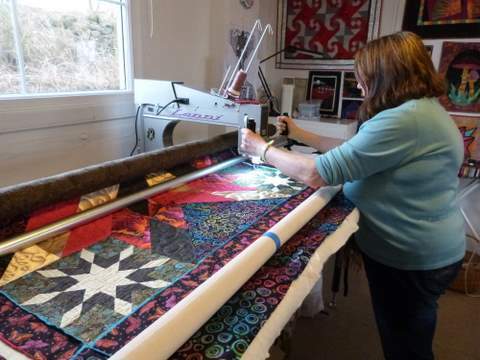 The two Carols brought their Silent Movie Start quilt tops along for their first attempts at longarming. We loaded up both machines and I flitted between them all day changing bobbins and giving them quilting tips. They did really well and were both pleased with what they managed to achieve in 6 hours. There was a knock on the door early one morning and a small incognito Ninja delivered a heart shaped cake to Freya as a Valentine Day treat. This was quite thrilling and we all enjoyed the scrumptious red velvet chocolate cake with yummy icing. There was actually rather a lot of cake in my house this week as I finally made the German apple cake that I had been nurturing from a sourdough starter mix for 10 days. It was also delicious so there was no effort made to diet! I wish I had a scullery in which to do all of my concocting, brewing and preserving. I have been culturing two more German cake mixtures but one met an untimely end and was discovered to have exploded all over the kitchen. I cannot say whether Blue Cat knocked it off or whether it spontaneously combusted but its pottery bowl was smashed to pieces. The gooey mixture that was as sticky as condensed milk was spread across the floor and dripping down the side of the cupboard. I was persuaded to attend a WRI meeting to listen to a talk and slideshow given by a friend who lived in Singapore for a while. Somehow I allowed myself to be volunteered for a quiz team. I had not been listening attentively to the arrangements so I was aghast to discover that it would not be held in a pub and there would be no chips. In the end it was surprisingly fun – there were around 20 other teams whose members were considerably senior to ours and we managed to finish fourth thanks to our combination of general knowledge and remembering snippets of useless information. There may not have been chips but the sausage rolls and Viennese fingers at half time were excellent. 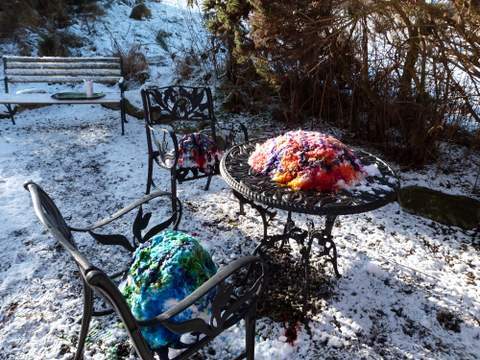 We finally had a light sprinkling of snow so I could attempt some snow dyeing. I scrabbled around scooping up a few bucketfuls and dribbled some strong solutions of procion dye onto the flannel sheets that had been treated with soda ash. It was quite exciting waiting to see what would happen. The steady thaw seemed ideal but I realised after a while that the dye was not penetrating into the middle part of the sheets and I didn’t want large white areas. I don’t think the snow was the right sort to give the crystalline effect. I turned them over and pushed the colourful slush back into the creases. The colours seemed very bright but after they had been rinsed much of this was lost so I am glad that I prepared strong dyes. They are nowhere near as intense as my Hungarian dyes so I am already wondering whether they would work better, applied directly to the snow as powder with salt. The trouble with snow is that it is cold and it has been hot water that has set my dyes so successfully in the past. I am keen to experiment again but perhaps I will have to wait a bit longer for the right kind of snow! Amazingly, we have had no lying snow so far this winter, despite significant amounts in the South for a change. I am not unduly upset at this as the schools have remained open and we have not been snowed in but I have now been waiting a year to try out snow dyeing. The sky looked quite threatening at one point so I rushed out and bought 3 flannel sheets to back my Christmas quilts and washed them in readiness but the weather got milder again. At least I will now be fully prepared – I have everything I need apart from snow. I would actually like just two days’ worth, preferably over a weekend. After two days of teaching I had a limited amount of time to work on the photo quilt with circles and lines. I became familiar with every picture by the time I had rolled the quilt up and down the frame a few times to complete the quilting designs. I was really pleased with the end result; Shona’s choice of pale batiks was very complementary to the photos which she had printed using a fine cotton bed sheet treated with Bubble Jet Set. 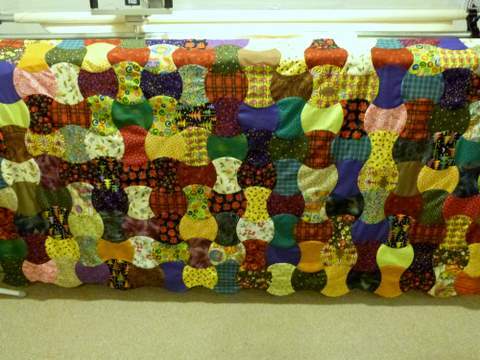 My Christmas fabric drawer was almost empty so I felt justified in ordering a few half yards online. I am sorry to say that I have not been inspired by the selection of festive prints on sale in British online quilt shops so my new collection is coming from eQuilter: including scuba diving Santas, hunky men in Christmas underpants, elephants, owls and gaudy baubles. I have been so pleased with the Accuquilt Go-Cutter shapes that I also ordered a giant hexagon die so that I can have “fun” with fewer set-in seams. I am really enjoying these quick and relatively easy projects that I can just work away at in between customer quilts, teaching and the trickier metallic wholecloths that require greater concentration. I taught three distinctly different types of pupil this week. One day I was a relief art teacher for 9-12 year olds, on another I taught part 3 of the Silent Movie Star Quilt, focusing on borders and edges and finally I spent a morning with Nursery children and I learned how to play “Sharks & Fishes”. 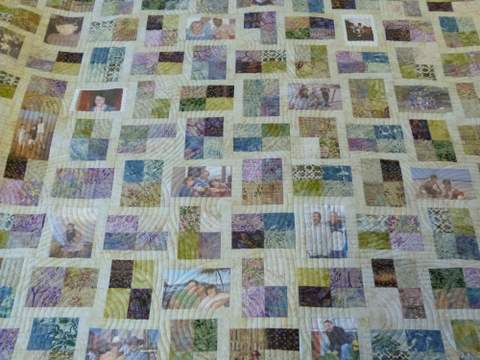 This did not leave much time for quilting but I started on a terrific customer quilt featuring printed photos set into pale coloured batiks. The planning of three-quarter circles and lines took me ages and it has to be completed by Thursday at the latest as it is being taken abroad as a gift so I will be busy with that AND teaching in schools for the next few days. I took my Featherweight machine into the house and pieced the Christmassy apple core blocks in between nagging about homework and ferrying children to extra-curricular activities. I am really pleased at how the “curvemaster” foot helped me to ease these tricky curved shapes together without using pins. The idea is to make each of my children a Christmas quilt well before next December using as much fabric from my existing stash as possible and a token piece of festive print every now and then. I think I will use a large tumbler block with some blue and green Asian prints and add in some small pieces of Christmas fabrics. I am now coveting the accuquilt 9″ hexagon cutting die that is currently only available in the USA. The third quilt will feature Amy Butler, Valori Wells and some others that are not obviously Christmassy but have an overall festive effect. 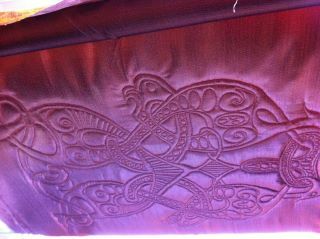 I hope to finish the quilting of a Norse carving onto a piece of hideous copper lurex. 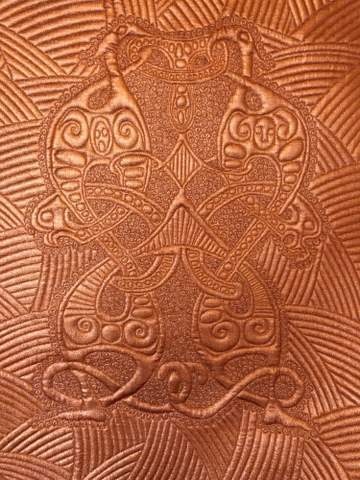 I traced the design onto the cotton backing fabric so that I could see what I was doing. The quilt is technically being worked on the frame “upside down” – there will be lots of threads to trim later, possibly some paint to add and perhaps some embroidery stitches to hide any iffy bits. I hope to try silver tissue-lame again using this method and Mo has given me an offcut of pewter coloured satin. These metallic projects seem to have become an accidental mini series!